What a wonderful 12 Metre summer we are going to have in Newport this year! Some 25 international teams representing more than 500 sailors, family, friends and supporters will converge at Newport in June-July for competitive racing, camaraderie and fun! America's Cup and Olympic sailors alongside accomplished amateurs will sail iconic yachts on Rhode Island Sound-- each seeking favorable wind shifts, avoiding negative tidal flows, carefully trimming and experiencing the thrill of top-notch sailboat racing just as America's Cup competitors did from 1958-1983. For 12mR sailors and enthusiasts, it doesn't get much better than that! The party starts at 6:30pm with cocktails in Harold Stirling (Mike) Vanderbilt's Trophy Room where we'll appreciate a private viewing of his impressive collection of sailing "hardware." Among "Mike's" numerous accomplishments are 5 Astor Cups, 6 Kings Cups and 3 America's Cup wins with the legendary J-Boats Enterprise (1930), Rainbow (1934) and Ranger (1937). He also served as Commodore of the NYYC from 1922-24, was a syndicate member of AC Defender, Intrepid (1967) and was posthumously inducted to the America's Cup Hall of Fame in 1993. He was a founder of the North American Yacht Racing Union (now US Sailing) and was one of 4 framers of the Racing Rules of Sailing officially adopted in 1960 by the International Yacht Racing Union (now World Sailing). At 7:30pm there will be a seated dinner, with limited availability. After dinner, the party will expand to include additional revelers for dancing and desserts. There may be a few thick heads on Friday morning, but it will be well worth it! Because as is their tradition, 12 metre crews will rally and return their focus to the racecourse the next day, just as their Newport AC Summer predecessors always did. An invitation for the Dinner Dance will be forthcoming via email with all of the details of the evening. Stay tuned, the 2019 12 Metre World Championship is now just 109 days away! 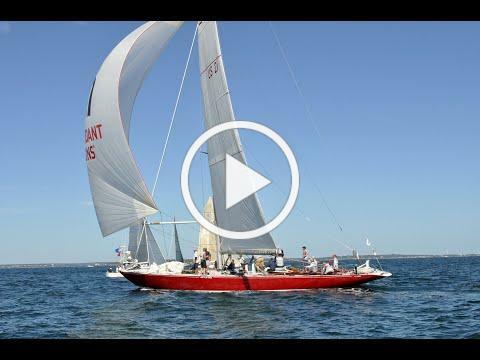 NEWPORT, RI (March 20, 2019) - When the 12 Metre World Championship comes to Newport, R.I. this summer (July 8-13), the significance of the venue will not be lost on sailing buffs, or for that matter, on sports historians in general. "Her interior was taken out by the second owner, who was getting it ready for the Worlds," said Toppa, who also sailed on and designed sails for Defender (US-33) in 1983 and Eagle (US-60) in 1986. "A lot of design work has been done, and everything has been changed, including the deck hydraulics, the mast, the keel, the trim tab and sail plan. Just a little over three months to go before the largest assembly of 12 Metre yachts meet on the starting for the 2019 12 Metre World Championships. During the past few months the event has really begun to take shape. We are expecting 21+ boats from 6 countries. In addition to primary Class Divisions -Grand Prix, Modern, Traditional and Vintage, we have added a 12 Metre "Spirit" Division which will allow boats built as 12s to participate in all the fun without having to meet Class requirements. Although not eligible to win the World Championship title, we will be happy to welcome 2-4 more "12s" to our historic gathering. There is a new opportunity to get into the game! We have recently learned that 1962 America's Cup winner Weatherly, US-17 is now available for charter for the Worlds. Contact owner, George Hill or America's Cup Charters for details. Bookmark our website for more racing information including updated Notice of Race-3/4/19, Amendment #1-3/4/19, Registration and more. Follow 2019 12mR Worlds blog for notice of updates direct to your in-box . QUEST magazine, official media partner of the 2019 12 Metre World Championship, has extended the opportunity for deeply discounted advertising rates for local businesses and supporters of the12 Metre Class until May 1. Make your reservation today; space is limited and my not last until May 1. I arrived at the Shipyard and noticed some damage to Valiant, unaware of the earlier events. It was all anyone could talk about and a few of the yard workers were visibly shaken. Valiant had been in the travel lift for re-launching; which meant that her backstay was off and the running backstays were slack. A few weeks ago Constellation was still on the loft floor at Minneford's. There are huge sheets of plywood, covered with a maze of black crayoned curves and diagonals and, as Nils Halvorsen points them out with a batten, they begin to form three views the craft: to one side the sections, as seen from down and stern, a wine-glass with no base; the rest, nearly 70 feet long, the profile and plan view superimposed, which can be disentangled to look something like a boat or a bullet. These are Constellation's lines, life-size, as drawn by Nils Halvorsen from the architect's 3/4-inch-to-the-foot scale plans. It is a job for a craftsman, because no matter how accurate the designer is when he draws the yacht on a drawing table, there are bound to be places in the scale of 70 feet where one dimension will not coincide with another- where, if the boat were built that way, a rib might be too narrow by several inches or planking might be forced to take an "unfair" curve. And when he finds these gaps of an inch or two between one plane and another, points to where section and plan do not quite intersect, Nils Halvorsen either "fairs in" the curve between them, using his own judgement, or if it strikes him as an especially crucial spot, he calls up Olin Stephens. When Stephens talks about "breakthroughs" he is thinking in terms of changes of a fraction of an inch here and there. Fractions here and there are the difference between a winner and a loser. Bill Luders and David Boyd, the British designer, might be able to look at those lines and see in which direction Stephens has gone, and they would probably like to; but for most it is guesswork, with guesses based, perhaps, on Gretel's down-wind ability and Weatherly's stiffness-- has Constellation a little more flare in the topsides than Columbia? Is there a triple more flatness in her run aft? Once in a while, there is a reminder that you shouldn't take it too seriously. Yachting is a sport. Boats are boats, though this is very much an ultimate boat, designed to furnish not only the maximum of completion to any challenger, but the most response to wind and sea as well. Quite possibly a form of masterpiece, a work of art. To that suggestion Olin Stephens returns a shrug and a laugh. "I don't know. It's just a question of doing your best." Together with Paul Coble, Nils Halvorsen, and Walter Gubelmann, he hopes that his best is good enough to defend the Old Mug against the British Twelve, and that Constellation, if she is chosen, won't be the first in the long history of the match to let the side down. From Finland to Newport, Here They Come! 2019 12mR World Championship Competitor Questionnaire! ATTENTION Owners & Program Managers: if you have not yet done so, please complete and return the 2019 12 Metre World Championship Competitor Questionnaire with a high-res photo to represent your team asap. We have tight deadlines to meet for our programme inclusion in QUEST magazine and request your help to insure that all teams will be included. Please contact SallyAnne Santos for assistance or questions. Attn: Owners, Captains & Project Managers: We currently have 19 crew candidate listings posted on our website. Each profile displays credentials, experience, availability and contact information. Eleven candidates indicate 12mR racing experience! Click through, perhaps you'll find your next crew MVP here.